Over the last three centuries the activities of Christian missionaries have been among the most significant aspects of the East-West encounter with Tibet. For most of this period, the missionaries were confined to the Indian and Chinese borders of the country, and they never made large numbers of converts. Nevertheless, individual missionaries spent much longer periods in the Tibet region than any other category of Westerner. Many learnt both literary Tibetan and regional dialects to a high degree of competence. Like any other historical source, their letters, diaries and official reports require critical rather than credulous examination. However, their long residence and deep personal engagement brought insights that are not readily available from any other source. The ‘sacred words’ of the title allude to the opening verse of St John’s Gospel: “In the beginning was the Word, and the Word was with God, and the Word was God.” Jesus spoke in Aramaic but the Evangelist wrote in Greek. For ‘Word’, he used logos, a term applied in Greek philosophy that was now adapted for the purposes of Christian teaching. Since the beginning, Christian teachers have grappled with the particular challenges of translation: how to use words associated with another culture to express new meanings. Questions about the church’s relationship with ‘earthly powers’ have likewise been a central theme of Christian history from the beginning. When asked whether it was lawful to pay taxes to the Roman Empire, Jesus responded that one should “render unto Caesar the things which are Caesar’s; and unto God the things that are God’s” (Matthew 22:21). In practice, earthly powers have sometimes seen Christians as subversive, and at other times have sought to co-opt them into pillars of state. While preaching the Word, Christian missionaries almost always find themselves engaging with governments and rulers in one way or another. To show how these themes apply to Tibet and neighbouring regions, I will begin with a review of the wider political and cultural environment in which the missionaries worked, and then select four case studies from a much wider body of material. These case studies range from the early 18th to the mid-20th centuries, and represent the full spectrum of Christian doctrine from Counter-Reformation Catholicism to Pentecostalism, as well as four nationalities, and four regions of Tibetan culture. The essay will show how different missionaries chose different strategies to meet the challenges of linguistic and cultural adaptation, as well as engagement with political authority. However, isolation and diversity have never been more than part of the story: mountains divide people, but mountain paths connect them. Tibet has always been linked to the outside world through an extensive network of pilgrimage and trade routes, for example those importing tea from western China, exporting wool and salt to India, and carrying musk to Central Asia. These routes have served as channels for the spreading of ideas as well as trade goods. In addition to the region’s close connections with China, there is evidence of cultural links with Iran as far back as to the first millennium and earlier. However, for the majority of Tibetans the most significant cultural connections have always been with India, the birthplace of Buddhism; and the ‘sacred words’ that carry the greatest weight are those of the Buddhist Dharma. The themes of translation and even of missionary activity are as central to Tibetan Buddhism as they are to Christianity. Tibetan belongs to the Tibeto-Burman group of languages in Central and South-east Asia. However, its script is based on an Indian model, related to the Devanagari script used for Sanskrit and modern Hindi. According to Tibetan tradition, the script was devised by Thonmi Sambhota, a legendary figure who travelled to India in the seventh century A.D. with a view to developing a Tibetan writing system. Tibetans express a special gratitude and veneration for Thonmi Sambhota and later generations of translators (lo tsa ba) who provided them with Tibetan versions of Sanskrit religious texts. Buddhist iconography sometimes depicts these translators as two-headed birds, a symbolic representation of their double linguistic fluency, looking and speaking in two directions at once. Continuing with the theme of ‘sacred words’, bka’ in Tibetan stands for both ‘word’ and ‘speech’, including the speech of the Buddha. The Kagyu (bka’ brgyud) sect is one of the four main schools of Tibetan lineage: the name stands for the oral transmission that takes place from teacher to disciple and from one generation to the next. Tibetan Buddhism places particular emphasis on the requirement for a personal relationship with one’s teacher, and on the importance of the spoken word as much as – or more than – the written one. The most famous monasteries are renowned for their libraries, and reading and learning sacred texts by heart forms a vital part of the monastic curriculum. However, religious leaders have at times hesitated to write down their teaching lest it be misunderstood by the uninitiated. One of the best-loved exemplars of the Kagyu tradition is Milarepa (Mi la ras pa -1053-1135). As a child he was maltreated by his uncle and aunt following the death of his father. He learnt black magic as a means of revenge, and invoked massive hailstorms to demolish their house during a wedding celebration and to destroy their crops. Repenting of his misdeeds, he asked the famous translator Marpa (Mar pa -1012-1097) to take him on as a disciple. Marpa agreed only after submitting Milarepa to a series of tests, asking him to build a stone tower and then to destroy it three times. After studying for twelve years, he achieved enlightenment, and thereafter lived the life of an ascetic, sheltering in a cave and subsisting on a diet said to consist mainly of nettles. The 100,000 Songs of Milarepa are among the most popular of Tibetan religious texts. While Milarepa represents the classic ascetic aspect of Tibetan tradition, Nawang Lobsang Gyatso (Ngag dbang blo bzang rgya mtsho – 1617-1682) is a very different but equally emblematic figure. In his capacity as the Fifth Dalai Lama he was responsible for initiating the construction of the Potala palace in Lhasa. The magnificence of the Potala contrasts with the simplicity of Milarepa’s cave: it reflects the Dalai Lama’s status as a spiritual master who also wielded political power. For most of Tibet’s modern history there has been no clear division between the spiritual and the temporal realms. The arrival of Christian missionaries therefore presented challenges at several different levels. Like his Jesuit predecessors in Japan and China, Desideri well understood the importance of establishing a favourable relationship with local rulers. He gives a positive account of a meeting with the king of the Tibetan Buddhist kingdom of Ladakh, noting that the Ladakhis used the word dkon mchog (‘the precious one’) for ‘God’, and had some conception of the Trinity (dkon mchog gsum). As he afterwards recognised, this was a misunderstanding: dkon mchog gsum refers to Buddhism’s ‘three precious gems’: the Buddha, the Dharma and the Sangha. He blamed the mistake in part on his interpreter, a Muslim from Kashmir who knew both Persian and Tibetan. Desideri formed a favourable impression of Ladakh and would have liked to stay there but his companion and ecclesiastical superior, the Portuguese Jesuit Manoel Freyre (1679-17?? ), insisted on pressing on for Lhasa, where he stayed for only a few days before returning via Nepal to India. Meanwhile, continuing with the strategy of ensuring that he was on good terms with the local authorities, Desideri arranged a meeting with Lhajang Khan, the Qosot Mongol ruler who at that time controlled Lhasa. Desideri was welcomed as a foreign teacher with an interesting new doctrine, and encouraged to learn Tibetan so that he could expound it more fluently. To advance this process, Desideri was invited to stay in the monasteries of Ramoche and Sera near Lhasa. In following his own advice, Desideri faced the challenge of finding appropriate words to express Christian teaching in a language whose philosophical terminology was closely associated with Buddhism. His problems started with the Christian Deity, a concept that the Tibetans did not recognise. Despite his experiences in Ladakh, he chose not to reject the word dkon mchog entirely, but to add a qualifying adjective. Thus, in his exposition of the Trinity, God is described as rang grub dkon mchog, the ‘self-existing precious one’. Desideri had expected to present his Tibetan exposition of Christianity in a public debate in front of Lhajang Khan. His hopes were dashed by the political upheavals of 1717-1718. A rival force of Dzungar Mongols captured Lhasa and killed Lhajang Khan. Desideri himself was forced to flee to the countryside. A Chinese army subsequently expelled the Dzungars and restored order, thus beginning the chain of events that led to the establishment of the Manchu protectorate in Tibet. Although Desideri was able to continue his studies, he did so in less favourable circumstances. However, Desideri’s mission ultimately failed not because of political upheavals in Tibet but because of ecclesiastical rivalries in Rome. In 1703 the Congregatio de Propaganda Fide had allocated Tibet to the Capuchins, a reformed order of Franciscan friars founded in 1525. Capuchin missionaries had operated in Lhasa between 1707 and 1711, but none were in residence when Desideri arrived in early 1716. However, a new Capuchin party returned to Lhasa later in the year, and immediately claimed an exclusive right to evangelise Tibet. Both sides appealed to Rome and seem to have worked alongside each other, albeit somewhat uneasily, while waiting for the outcome. Eventually, Desideri received an incontrovertible order to withdraw, and left Tibet in 1721. Once back in Rome, he again appealed to be allowed to return to Tibet, but had no success, and died in 1733. The Capuchins continued their mission in Lhasa until 1745. The Tibetans seem to have appreciated them because of their medical contributions, but they made no converts until the early 1740s. The first Tibetan baptisms then prompted a backlash, illustrating the lack of a clear division between the political and the spiritual arenas. The key issue was whether the converts should have to perform corvée labour, including the reciting of Buddhist prayers which was regarded as a civic duty. The Lhasa authorities ultimately banned the missionaries from attempting to convert Tibetans. In April 1745, they withdrew from Lhasa, temporarily as they thought, but in fact never to return. Of all the Capuchins, Orazio della Penna (1680-1745), who had studied alongside Desideri in Sera, had the best knowledge of Tibetan: he prepared a series of Christian texts in the language, as well as translations of Buddhist writings, all of which are now lost. Between 1733 and 1741, Orazio was in Rome seeking support for his mission and, while he was there, supervised the preparation of a set of moveable type – the first to be created for Tibetan – and carried this back to Lhasa together with a press. The Capuchins left the press behind when they left Lhasa in 1745, and it therefore never made a significant contribution to the Tibetan art of book-making. However, the font was used in a book published in Europe. This was the Alphabetum Tibetanum, a two-volume work published in Rome between 1759 and 1762 by the Augustinian Friar, Antonio Agostino Giorgio (1711-1797). Giorgio drew on information provided by della Penna but had never himself travelled to Tibet, and the first volume reflects his personal theological preoccupations, notably the need to combat Manichaeism. The second, shorter volume is on the Tibetan language. An appendix contains Tibetan versions of key Christian texts, including the Lord’s Prayer and the Apostles’ Creed. Following Desideri, the term used for ‘God’ in the creed is rang grub dkon mchog. For several decades, the Alphabetanum Tibetanum was the most detailed source of information on Tibet that was publicly available in Europe. The title and first lines of the Ten Commandments in Tibetan and Latin as presented in Giorgi’s Alphabetum Tibetanum. The words used for ‘God’ are rang grub dkon mchog, and the word for ‘commandment’ or ‘precept’ is bka'. Orazio also compiled a manuscript Tibetan-Italian dictionary which in 1818 came into the hands of a German Protestant missionary, F.C.G. Schroeter (d. 1822). Schroeter used it as the basis for a draft Tibetan-English dictionary, but died before he was able to complete his work. However, two Baptist missionaries, William Carey (1761-1834) and John Clark Marshman (1794-1877), edited and published his work in 1826 under the title Dictionary of Bhotanta. Carey’s introduction acknowledged that the dictionary was based on the work of “the Roman Catholic missionaries who formerly laboured in Tibet”, but he apparently did not know their names. The dictionary had a second, unacknowledged link with the Capuchins in that the Tibetan font was based on the typeface used for the Alphabetum Tibetanum. 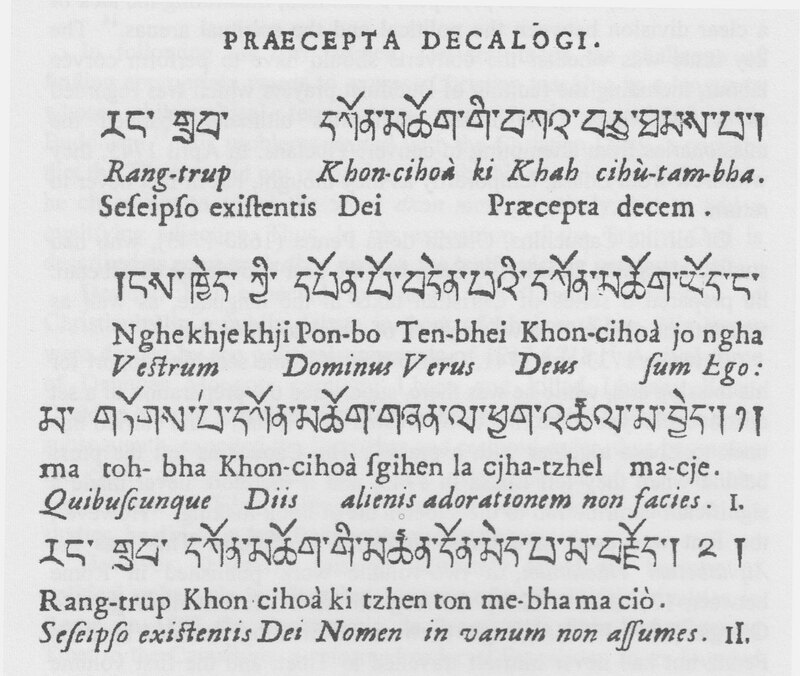 This was the first Tibetan dictionary in any European language. However, the circumstances in which it had been produced led to many imperfections, and it was quickly superseded by the work of the Hungarian scholar Alexander Csoma de Kőrös (1784-1842), whose Essay Towards a Dictionary, Tibetan and English appeared only eight years later. For almost exactly a century, no Catholic missionary made any attempt to enter Tibet. In 1846 two French Lazarist priests, Régis-Évariste Huc and Joseph Gabet, travelled from north-east China to Lhasa. The Chinese Amban (commissioner) refused to allow them to stay for more than a few weeks, but they were well treated, and hoped to be able to return to Tibet set up a mission. This did not happen because earlier in 1846 the Vatican had already decided to allocate Tibet to the Missions Étrangères de Paris (MEP). The MEP had been founded as a missionary society in 1658, during the reign of Louis XIV. From their beginnings they specialised in Asia: first China and Siam (Thailand) and then Indo-China, Korea and Japan. They were a natural choice for Tibet because they had already been operating in the neighbouring Chinese province of Sichuan since the 18th century. In response to the commission from Rome they now extended their sphere of operations to the Sino-Tibetan border areas, often known as the Tibetan Marches. This region is part of the Tibetan province of Kham, and today is divided between the Chinese provinces of Sichuan and Yunnan as well as the Tibetan Autonomous Region (TAR). The MEP continued their work in the area – latterly in association with canons from the Congregation of Great St Bernard (Switzerland) – from the 1840s until the expulsion of the last missionaries in 1952. Throughout the 19th and early 20th centuries, the Tibetan Marches suffered from endemic political and social instability, and at several different levels. The Manchu Empire had established formal political control over much of the region in the 18th century. However, in practice the local rulers of a chain of principalities along the border held a high degree of local autonomy, and large tracts were outside the effective control of any central authority. The combination of disputed boundaries and local banditry made for a high degree of insecurity. Ten of the 69 MEP missionaries who worked on the Tibetan borders came to a violent end, as did one of the 12 St Bernard canons. The missionaries were remarkable for their tenacity. In the early period of the mission’s history, the MEP tried to take advantage of the 1860 Treaty of Peking – one of the famous ‘unequal treaties’ – according to which the Chinese government guaranteed freedom of religion throughout the Chinese empire. Both the MEP and the French legation believed that the treaty applied in Tibet as well as in China. The missionaries therefore tried to enlist Chinese support in a dispute involving the mission station of Bonga, which was within the borders of Tibet. When the Chinese government was slow to respond, the MEP appealed to the French legation. The response of the Chinese foreign ministry was that China’s authority in Tibet was conditional on its support for Buddhism, and that it could therefore scarcely intervene on behalf of the missionaries. The outcome was that the missionaries were expelled from their foothold inside Tibet in 1865, and thereafter were obliged to confine themselves to the border areas that were under direct Chinese control. In 1887 an attack apparently instigated by the local Buddhist monastery forced the MEP to withdraw from their station in Bathang, even though the town was supposed to be under China’s political control. The missionaries believed that the attack had been in part instigated by Lhasa in reaction to British expansion in Sikkim: the Tibetans apparently thought that French missionaries and British officialdom shared the same agenda of conquering Tibet. Similarly, in 1905 an uprising in Bathang and surrounding areas led to the death of four missionaries: they were singled out because of the mission’s supposed association with the 1903-1904 British military expedition to Lhasa. In both cases the MEP appealed to the Chinese authorities for support and restitution. From a Tibetan perspective this would have reinforced their status as hostile outsiders. From 1905 to 1910 the Chinese general Chao Erh-feng led an extended military campaign to establish full Chinese control over the Tibetan Marches and ultimately over Lhasa itself. However, the 1911 Chinese revolution led to Chao’s death and the collapse of his offensive. The Tibetans expelled the last Chinese troops from Lhasa in 1912-1913, and the Dalai Lama’s government was thereafter able to govern in complete independence from China. In 1918, through British mediation, the Chinese and Tibetans reached an interim agreement on their common boundary. However, this amounted to a truce rather than a lasting settlement, and the MEP continued to suffer from political instability in their last three decades in the Tibetan Marches. In the 1920s Sichuan was caught up in a series of conflicts between rival Chinese generals. Between 1928 and 1933 there was a renewed border crisis between Tibet and China. In 1936 the Chinese Communist Party’s Long March swept through the region. From 1937 to 1945 China was at war with Japan, and the country was then caught up in a further period of internal conflict until the communist takeover in 1949. These successive national crises and local crises inevitably had repercussions on the mission. In 1932, as a result of a boundary realignment, the MEP parish of Yerkalo came under Tibetan control. The mission was at first allowed to operate relatively freely, but then became involved in a series of controversies with local landowners and monasteries over taxation and religious freedom. In 1946, Maurice Tornay, the St Bernard canon who was in charge of Yerkalo, was forced to take refuge across the Chinese border. Having had no success in a series of attempts to garner support from the Chinese, French and Swiss governments, he decided to appeal directly to the Lhasa authorities for the right to return, and set out for the Tibetan capital in August 1949, only to be murdered soon after crossing into Tibet. Like other missionaries in the region, the MEP engaged in linguistic research as an essential precondition of their prime task of preaching the Word. In 1852 Charles Renou (1812-1863), one of the pioneers of the mission, spent several months learning Tibetan at the monastery of Dondupling (Don grub gling) in Yunnan. At this point he was pretending to be a Chinese merchant, a disguise that was only plausible because no Europeans had passed that way previously. Renou achieved sufficient skill in Tibetan to translate into the language a series of morning prayers, a catechism and a life of Jesus Christ. He also compiled a draft Tibetan vocabulary. His colleague Auguste Desgodins (1826-1913) expanded Renou’s early work, and eventually published a Tibetan-Latin-French dictionary in Hong Kong in 1899. The dictionary’s Latin component was essential because of the language’s importance as a vehicle for Roman Catholic theology. On page 24 the dictionary noted that dkon mchog was an inadequate word to express the attributes of the one creator God. Following the usage of the Chinese Bible translations, the official Catholic term was now gnam gyi bdag po, the ‘Lord of Heaven’. Mgr Pierre Giraudeau (1850-1941) and Francis Goré (1883-1954) contributed to a subsequent Dictionnaire français-tibétain. However, this was not published until 1956, after both their deaths and the demise of the MEP’s Tibet mission. The MEP missionaries also published a series of Tibetan language catechisms, devotional books and saints’ lives at the MEP press in Hong Kong and, after 1930, at their regional headquarters in Tachienlu (now known as Kanding). For the most part these appear to have been translations rather than original compositions. The promulgation of the People’s Republic of China in October 1949 resolved China’s internal political power struggle but at the same time introduced a new period of uncertainty for foreign missionaries. At first they were able to operate with a degree of flexibility, but the vice gradually tightened. The last MEP missionaries were expelled in 1952. The Moravian Church or Unitas Fratrum (Unity of Brethren) traces its beginnings to 1457 when a new Christian community was founded in Kunwald, Bohemia. The church grew rapidly in central Europe over the following century and a half, but was effectively suppressed in the course of the Thirty Years War. However, a ‘Hidden Seed’ – the term recalls the Japanese Kakure Kirishitan – kept faith with the tradition of the Unitas Fratrum. In the 1720s a group of refugees from Moravia settled on the estate of Count Nikolaus Ludwig von Zinzendorf in Herrnhut, Saxony, and in due course re-established the Unitas Fratrum under his leadership. Theologically and socially, the Moravians had much in common with the early Methodists in England. From the outset the revived church placed a strong emphasis on missionary work. In 1850, in response to an appeal from the China missionary Karl Gützlaff, the Moravians decided to send missionaries to Mongolia. Since it was then impossible for them to travel via either Russia or China, the two pioneers – August Wilhelm Heyde (1825-1907) and Eduard Pagell (1820-1883) – set out for India in 1853. Finding that the Tibetan frontier was closed to them, they set up mission stations in Kyelang (Lahul – 1856), Poo (Kinnaur – 1865) and Leh (Ladakh – 1885). Their main focus was now on Tibet, preparing for the day when the country would be open to foreign missionaries. The missionaries arrived during the period when the British were first establishing their authority over north-west India. This process was not entirely smooth – 1857 was the year of the great north Indian Mutiny/Rebellion – but it was largely effective. Lahul was administered directly by the British as part of Punjab. Ladakh was part of Jammu & Kashmir, while Kinnaur belonged to Bashahr, both of which were semi-autonomous princely states within the Indian empire. The Pax Britannica gave the missionaries a relatively tranquil environment until Indian independence and partition in 1947. Several missionaries and their children died prematurely from disease but – unlike their counterparts in eastern Tibet – none from violence. In this respect the ‘earthly powers’ worked in the Moravians’ favour by providing an essentially supportive environment in which to conduct their missionary activities. From the beginning these activities included a strong focus on language study. The greatest Moravian linguistic scholar was Heinrich August Jäschke (1817-1883), who arrived in India in 1857 and, soon after his arrival, travelled from Lahul to Ladakh to immerse himself in the local language. Jäschke was able to draw on Schroeter’s Dictionary of Bhotanta as well as Csoma de Kőrös’s Tibetan dictionary. However, he quickly felt the need to conduct his own lexical research. The eventual outcome was A Tibetan-English Dictionary with Special Reference to the Prevailing Dialects (1881), which was published with the help of a British government subsidy, and is still widely used. Jäschke’s sources included literary texts such as the 100,000 songs of Milarepa, together with informants from central and eastern Tibet as well as Ladakh and Lahul. In the course of his research, he discovered for himself the truth of the saying “every district its own dialect”. The spoken language of Ladakh differs from literary Tibetan (chos skad) much as Italian differs from Latin, and from the spoken language of Central Tibet much as Italian differs from Spanish. In keeping with their Protestant traditions, the Moravians were anxious that the Bible should be as accessible as possible to ordinary people. However, the spoken languages of the wider Tibetan world differed both between regions and even from valley to valley. A Bible translated into colloquial Ladakhi dialect would be incomprehensible in Lhasa. Jäschke’s solution was to adopt a modified form of chos skad, in the hope that this would be understandable all over the Tibetan plateau. Jäschke had to make similar choices with regard to other key words. For logos he chose bka’ without any apparent reservations. For ‘angel’ he considered lha, the word for minor deities and ‘spirits of place’ that in Tibet are roughly analogous to local kami in Japan. However, he decided instead to use pho nya, a word that simply means ‘messenger’, and has no particular spiritual associations. Jäschke published drafts of the different sections of the New Testament from 1861 onwards, and the full New Testament, which also included contributions from his successor F.A. Redslob, was published in 1885, two years after his death. He had always thought that his initial translations would need to be revised, and in 1898 the British and Foreign Bible Society (BFBS) helped set up a revision committee which met in Ghoom, near Darjeeling, and included missionaries familiar with the Lhasa dialect as well as A.W. Heyde, one of the two Moravian pioneers who had set out from Herrnhut nearly half a century earlier. The revised New Testament was published in a single volume in Ghoom in 1903. Meanwhile, a team of Moravian missionaries and Ladakhi colleagues had already begun work on the translation of the Old Testament, a project that continued intermittently for several decades. Among the team, the most important figures were the German missionary August Hermann Francke (1870-1930) and his Ladakhi colleague Joseph Gergan (1878-1946), who in 1921 was one of the first two Ladakhis to be ordained to the Moravian ministry. The arrangement that emerged after the First World War was that Gergan prepared the first draft in India, drawing on a range of English translations and commentaries. He then sent the drafts to be revised by Francke, who was now back in Germany. Francke in turn sent his revisions to David Macdonald (1870-1962), an Indian Political Service officer of mixed Scottish and Lepcha descent who served for many years as British Trade Agent in Yatung (Tibet). His role was to comment on the drafts in the light of his familiarity with the Lhasa dialect. Gergan completed his first set of drafts in 1928, but the process of finalising the translation was delayed, first by Francke’s death in 1930, and then by the Bible Society’s initial reluctance to go to the expense of publishing the full Tibetan Bible until the need for it was clearly established. Meanwhile, Gergan on his own initiative started revising the New Testament. After further negotiations with the Bible Society, the Tibetan Bible was finally published in Lahore in 1948, nearly a century after the work of translation had first begun. While supporting the idea of producing a chos skad Bible that would be accessible all over Tibet, Francke also emphasised the importance of producing Christian literature that would be closer to the spoken language in Ladakh. His initiatives in this direction included a Ladakhi Gospel of St Mark, which was published on the Leh mission press in 1908. Francke was also responsible for introducing a local monthly paper the La dvags kyi ag bar, which appeared between 1904 and 1908, and contained Ladakhi and international news, as well as short stories and religious quotations. Most Ladakhis associated the written word with the Buddhist scriptures; Francke hoped that the paper would make them more accustomed to reading a completely different kind of text and thus, in the long term, more open to Christian teaching. Francke’s linguistic interests led him to the study of Ladakhi oral literature in the form of folktales, folksongs and the Ladakhi version of the Kesar epic. He was also drawn to the study of Ladakhi and Tibetan history through the study of historical documents and rock inscriptions. As well as being of interest in their own right, these provided an insight into Ladakhi linguistic patterns and cultural attitudes that could be applied to the work of Bible translation. Gergan came to share all these sets of interests. From Francke he acquired deep interest in Ladakhi history, and he composed his own Christian literature in Tibetan/Ladakhi style. His most significant contribution in this area was Rna ba’i bcud len gyi rtogs brjod bzhugs so (‘Understandable Expression of Moral Thoughts’), which was published on the Kyelang mission press in 1926. This begins with an uncompromising affirmation of faith in “God, who is without beginning or end, the One who is Holy, Omnipotent and Omnipresent, and whose love and power sustains the whole world.” It concludes with an acrostic poem in praise of Jesus in which every line begins and ends with a letter of the Tibetan alphabet in alphabetical order. Gergan was using the Tibetan love of word play to express a religious message that for him was now indigenous. The fourth set of missionaries to be discussed in this essay worked in north-eastern Tibet in the region known to Tibetans as Amdo, which has now been incorporated into the modern Chinese province of Qinghai. The north-eastern Tibetan-Chinese border regions have always been ethnically diverse. The main urban centre is Xining which historically was a walled city, largely inhabited by ethnic Chinese, and served as the headquarters for the regional governor. However, the border regions were and are home to substantial populations of Mongols and Hui and Salar Muslims. The Tibetans included both settled agriculturalists as well as nomads in the grasslands to the east and south-east of Xining. In the past the nomads were effectively autonomous: they offered scant allegiance to any political authority, apart from their own tribal chiefs, but were linked to the markets of north-west China through trade networks mediated by Muslim traders, and belonged to the wider religious universe of Tibetan Buddhism. The first American missionaries working in the region belonged to the Christian & Missionary Alliance (C&MA), a missionary society founded by the revivalist preacher Dr A.B. Simpson in 1887. The first C&MA missionaries, William Christie and David Ekvall, set up the so-called Kansu-Tibetan Border Mission in the late 1890s. They and their successors established a network of mission stations working among the Chinese and Muslim communities as well as Tibetans. Meanwhile, in the US the early 20th-century Pentecostal revival led in 1914 to the establishment of a new church, the Assemblies of God. A number of earlier C&MA supporters, including several missionaries in Kansu, switched their allegiance to the Assemblies. As in the eastern Tibetan Marches, missionary activity took place against a background of persistent political instability. During the Manchu period the region was hit by a series of particularly bloody Muslim rebellions. The proclamation of the Chinese Republic in 1911 was followed by a power struggle between rival warlords, culminating in full-scale civil war between 1925 and 1927. In 1936 the Chinese Communist Party’s Long March passed through the region. Although the region was outside the main theatres of China’s war with Japan from 1937 onwards, it was affected several times by outbreaks of plague and famine. Victor Plymire (1881-1956) is representative of the earlier group of C&MA missionaries who subsequently joined the Assemblies of God. Converted at a street service at the age of 15, he set out for China as a C&MA missionary in 1908 and began learning Tibetan from his base in Taochow (now known as Lintan). In 1920 he was ordained as an Assemblies of God minister while on furlough in the US, and, after returning to Kansu, set up a new station at Tangar (now Huangyuan). Tangar was a border town, close to Xining but on one of the main trade routes to Tibet. It remained his main base for the rest of his missionary service apart from further periods of furlough in the US. In 1927, soon after the deaths of his first wife and son from smallpox, he made a notable journey right across Tibet to Ladakh. He and his second wife and two children finally left Tangar in June 1949, and initially hoped to return to the small Christian community there before realising that the changed political situation made it impossible for them to do so. Plymire’s approach to missions involved regular evangelistic journeys, for example to major fairs and monastic festivals, as well as ‘itinerating’ among the nomadic groups of the grasslands. He no doubt made use of the spoken word but placed at least as much emphasis on the written word as represented by simple tracts. For example, he writes with satisfaction of the number of tracts distributed right across Tibet on his great journey from Amdo to Ladakh. The tracts in question are simple expositions of Christian teaching written in Tibetan, but in a style that would have been recognisable at an American revivalist meeting. One example shows a drawing of the cross, with the message that it is the only bridge between God and man. Plymire writes with enthusiasm of his personal friendship with a Mongol leader in the grasslands, but in his pamphlets and correspondence there is little evidence of a real engagement with Tibetan religious thinking. He would probably have argued that this was scarcely necessary; his own task was to convey the Christian message as simply as possible, and to leave the rest to divine providence. By contrast, the writings of the C&MA missionary Robert Ekvall (1898-1983) point to a much greater sense of empathy with Tibetan and Chinese modes of thought. The son of the C&MA pioneer David Ekvall, he was born in China and grew up speaking Chinese as fluently as English. After his education in the US he returned to China in 1922 and, together with his wife Betty, quickly developed a special interest in Tibetan missionary work. He served in the Tibetan border areas until 1941, apart from two extended periods on furlough in the US. In his later career he served successively as an army officer, an interpreter between Chinese and English at diplomatic negotiations in Panmunjom and Geneva, and an academic researcher. Ekvall later observed that he had found himself mediating between cultures from a very early age and in all his subsequent careers. He was not a translator into literary Tibetan in the tradition of Jäschke, Francke or Gergan. However, his writings – which range from poetry to novels, autobiography and technical academic treatises – display a deep interest in both the written and the spoken word. He comments that the task of translation caused him to rethink his own ideas. Basic concepts on which belief is grounded or from which motivation springs lose some of the narrowness of purely Western meaning when uttered in Eastern speech and, so spoken, become more the rounded whole of human desire and aspiration – the cry of all the sons of Adam – more universal and therefore more truly Christian. In his academic writings, he pointed to the importance of speech and oratory in Tibetan society. On a more philosophical note, he emphasised “that the power of speech, the power of thought and the power of action – or mouth, mind and body – make up the triad of personal being” in Tibetan thought. By the mid-20th century, despite years of often intense activity, the various Christian churches had established no more than a precarious foothold on the borders of Tibet, and nothing at all in the centre of the country. At least part of the reason for this limited impact was the continuing linguistic and conceptual challenge of communicating the Christian message in a manner that – in Ekvall’s phrase – truly “made sense” to the Tibetan mind. A second critical factor was the impact of the various political environments in which the missionaries operated. At a minimum, they needed the permission of the local centres of power to operate at all. In Lhasa Desideri was initially welcomed as a visiting teacher with an interesting new doctrine, but he never came close to making any converts. Once the Capuchins did start baptising Tibetans, they came to be seen as subversive not only of spiritual but also of political authority in a culture where there was no clear boundary between the two. In the 19th and 20th centuries the Missions Étrangères invoked French diplomatic support to secure Chinese protection in Tibet and the Tibetan border areas. However, in doing so, they risked being identified more rather than less with external political powers. In India, the Moravians benefited from the secure environment provided by British rule, but they too they were often viewed as representatives of a foreign religion. The late 1940s and early 1950s mark a watershed in the history of Christian missions in the region. After 1949, the newly established People’s Republic of China restricted mission activity, and by 1952 all the remaining foreigners in the Sino-Tibetan border regions had been expelled. The changes that followed Indian independence in 1947 were less dramatic, but the last Moravian missionaries left Ladakh in 1956. From the mid-1950s until 1973, the region was closed to foreigners altogether because of its proximity to disputed boundaries with both China and Pakistan. Nevertheless, despite all these upheavals, Christian churches under local leadership have established firm roots in the Tibetan border areas. Today, the Moravian church has three congregations in Ladakh and, although its total membership runs into the hundreds rather than the thousands, it remains an established part of Ladakh society. Its most visible contribution is the Leh Mission School, which was revived in 1980. The church also runs a second school in Rajpur, near Dehra Dun, which was set up for Tibetan refugees in the 1960s. Meanwhile, the Roman Catholic church has re-emerged in the eastern Tibetan border regions, and now counts several thousand adherents. The Christian community established by Victor Plymire in Huangyuan likewise appears to be flourishing. Many of the old themes still apply. In Ladakh, one of the great grandsons of Joseph Gergan is preparing a new translation of the New Testament in colloquial Ladakhi as distinct from literary Tibetan. In China a new generation of missionaries are experimenting with more colloquial translations of the Bible for Tibetans in Central Tibet and in Kham. In another new variation on an old theme, a recent essay on contemporary Tibetan Catholics in the Tibet-Yunnan borderlands discusses the challenges that they face in “negotiating foreignness” – establishing local roots for a religion that in their region is more often associated with foreigners. Missions Étrangères de Paris, 128 rue du bac, 75007 Paris. www.mepasie.org. Moravian Church Archive and Library, Moravian Church House, 5 Muswell Hill, London N10 3TJ. www.moravian.org.uk. Unitätsarchiv der Evangelischen Brüder-Unität (Moravian Church). Zittauer Str. 24, D-02747 Herrnhut. www.archiv.ebu.de. Csoma de Kőrös, Alexander. 1834. Essay Towards a Dictionary, Tibetan and English. Calcutta. Desgodins, Auguste (Ed.). 1899. Dictionnaire thibétain-latin-français, par les missionnaires catholiques du Thibet. Hong Kong. Desideri, Ippolito. 1981-89. Opere tibetane di Ippolito Desideri, S.J. Edited and translated into Italian by Giuseppe Toscano. 4 Vols. Rome. Desideri, Ippolito. 2010. Mission to Tibet: The Extraordinary Eighteenth-Century Account of Father Ippolitio Desideri, S.J. Translated by Michael J. Sweet. Edited by Leonard Zwilling. Boston. Ekvall, Robert B. 1938. Gateway to Tibet: The Kansu-Tibetan Border. Harrisburg. _______. 1939. Cultural Relations on the Kansu-Tibetan Border. Chicago. _______. 1960. Faithful Echo. New York. _______. 1964. Religious Observances in Tibet: Patterns and Functions. Chicago. _______. 1968. Fields on the Hoof: Nexus of Tibetan Nomadic Pastoralism. New York. _______. 1981. The Lama knows: a Tibetan legend is born. 2nd ed. Novato, California. _______. c.1981. Transcript of interview with Robert Schuster. Wheaton, Ill. Billy Graham Center. www.wheaton.edu/bgc/archives/trans/092t02.htm. Accessed on 31 May 2011. Francke, August Hermann. 1897. “Bemerkungen zu Jäschke’s Bibelübersetzung.” Zeitschrift der deutschen Morgenländischen Gesellschaft 51, pp. 647-657. Giorgi, Antonio Agostino. 1759-1762. Alphabetum Tibetanum Missionum apostolicarum commodo editum. Rome. Giradeau, Pierre & Goré, Francis. 1956. Dictionnaire français-tibétain (Tibet oriental). Paris. Huc, Régis-Évariste. 1850. Souvenirs d’un voyage dans la Tartarie, le Thibet et la Chine pendant les années 1844, 1845 et 1846. Paris. Jäschke, Heinrich August. 1881. A Tibetan-English Dictionary with Special Reference to the Prevailing Dialects. London. Petech, Luciano. 1952-56. I Missionari Italiani nel Tibet e nel Nepal. 7 vols. Rome. Schroeter, Frederic Christian Gotthelf. 1826. A Dictionary of the Bhotanta, or Boutan Language. Edited by John Marshman. Serampore. Walravens, Hartmut (ed.). 2010. The First Tibetan Serial: August Hermann Francke's La-dvags-kyi-ag-bâr (1904-1907); Facsimile of a Unique Set in the Archives of the Evangelische Brüderunität, Herrnhut. Staatsbibliothek zu Berlin. Neuerwerbungen der Ostasienabteilung. Sonderheft 22. Berlin. Bray, John. 1991. “Language, Tradition and the Tibetan Bible”. Tibet Journal 16, No. 4, pp. 28-58. Dharamsala. _______. 1997. “French Catholic Missions and the Politics of China and Tibet 1846-1865.” In Tibetan Studies: Proceedings of the 7th Seminar of the International Association of Tibetan Studies, Graz 1995, Vol. 1. pp. 83-95. Edited by Helmut Krasser, Michael Torsten Much, Ernst Steinkellner and Helmut Tauscher. Vienna. _______. 2008. “Missionaries, Officials and the Making of the Dictionary of Bhotanta, or Boutan Language.” Zentralasiatische Studien 37, pp. 33-75. Deshayes, Laurent. 2008. Tibet (1846-1952): Les missionnaires de l’impossible. Paris. Didier, Hugues. 2002, Les portugais au Tibet: Les premières relations jésuites 1624-1635. 2nd ed. Paris. Engelhardt, Isrun. 2005. “Between Tolerance and Dogmatism: Tibetan Reactions to the Capuchin Missionaries in Lhasa, 1707-1745.” Zentralasiatische Studien 34, pp. 55-97. Hurst, Randy. 2010. “A Call to Obedience. Victor and David Plymire.” Pentecostal Evangel No 5030, pp. 1-31. 3 October 2010. Springfield, MO. Jackson, David F. 2004. “The Life and Writings of Robert B. Ekvall (1898-1983): Missionary, Soldier-Interpreter and Observer of Tibetan Nomadic Life.” In Three Mountains & Seven Rivers, pp. 609-635. Edited by Shoun Hiro and Toshihiro Wada. New Delhi. Lamb, Alastair. 1989. Tibet, China & India 1914-1950: A History of Imperial Diplomacy. Hertingfordbury. Launay, Adrien. (c. 1905). Histoire de la Mission du Thibet. 2 vols. Paris. Lim Khek Gee, Francis. 2009. “Negotiating ‘Foreignness’, Localizing Faith: Tibetan Catholicism in the Yunnan-Tibet borderlands.” In Christianity and the State in Asia: Complicity and Conflict pp. 79-96. Edited by Julius Bautista & Francis Khek Gee Lim. London. Marquis-Oggier, Claire & Darbellay, Jacques. 1993. Le Bienheureux Maurice Tornay: un homme séduit par Dieu. Martigny. Petech, Luciano. 1972. China and Tibet in the Early 18th Century: History of the Establishment of the Chinese Protectorate in Tibet. 2nd ed. Leiden. Pomplun, Trent. 2010. Jesuit on the Roof of the World: Ippolito Desideri’s Mission to Eighteenth Century Tibet. New York. Quintman, Andrew (trans). 2010. The Life of Milarepa. London. Schaeffer, Kurtis R. 2009. The Culture of the Book in Tibet. New York. Schneider, Bernardhin. 2003. “Bible Translations.” In Handbook of Christianity in Japan, pp. 205-225. Edited by Mark Mullins. Leiden. Sweet, Michael J. 2006. “Desperately Seeking Capuchins: Manoel Freyre’s Report on the Tibets and their Routes (Tibetorum ac eorum Relatio Viarum) and the Desideri Mission to Tibet.” Journal of the International Association of Tibetan Studies 2 (August 2006), No. 2, pp. 1-33. Uray, Géza. 1983. “Tibet’s Connections with Nestorianism and Manicheism in the 8th-10th Centuries.” In Contributions on Tibetan Language History and Culture, Vol. 1 pp. 399-429. Edited by Ernst Steinkellner and Helmut Tauscher. Vienna. Wessels, C. 1924. Early Travellers in Central Asia. The Hague. On the tension between the spoken and the written words see Schaeffer (2009) pp.1-4. For a recent translations of Milarepa’s Tibetan biography see Quintman (2010). For earlier Nestorian contacts see Uray (1983). Wessels (1924) is still the single most useful authority on the early Jesuit missions. For a more recent study on Tsaparang, see Didier (2002). For a succinct biography of Desideri, also available online, see Bargiacchi (2008). For a more detailed study, including a detailed analysis of his Jesuit formation, see Pomplun (2010). .
 A critical edition of the Italian text of the Notize Istoriche is included in Petech (1952-1956), Vols. 5-7. For Sweet’s excellent new English translation, see (Desideri 2010). Toscano published Italian translations of four of Desideri’s Tibetan books, together with reproductions of the Tibetan texts (Desideri 1981-1989). Petech 1954 (vol. 5), p.36. Petech 1955 (vol 6.). pp. 301-309. Desideri (2010), pp. 448-449. On Freyre and his possible motivations, see Sweet (2006). Sweet’s translation in Desideri (2010), p. 83. On these problems, see Toscano’s translations as well as Pomplun (2010), pp. 154-159. Christian translators in Japan have faced similar problems. For an overview, see Schneider (2003). Petech (1972) is the most authoritative guide to early 18th-century Tibetan politics. See Engelhardt (2005) for a discussion of these developments. The Tibetans have a long history of printing, but using carved wooden blocks rather than moveable type. On Schroeter’s researches and the publication of the dictionary see Bray (2008). The manuscript dictionary still survives, and is now in a private collection in Italy. See www.oraziodellapenna.com (accessed on 28 May 2011). The phrase is from the Latin hymn of thanksgiving, dating back to the 4th century, whose opening words are: “Te Deum laudamus: te Dominum confitemur” (“We praise thee, O God: we acknowledge thee to be the Lord.”). Photographs of the bell and a modern reproduction can be seen on www.oraziodellapenna.com. Its Japanese equivalent is a bell cast for Hosokawa Gracia (1563-1600), the Christian wife of a Japanese aristocrat, which was hidden after the Tokugawa suppressed Christianity. The bell is now at the Eisei Bunko Museum in Tokyo. A photograph can be seen on www.asianart.com/exhibitions/samurai/3.html (accessed on 29 May 2011). In addition to the sources cited, this section also draws on research at the MEP archive in Paris. I gratefully acknowledge the support and assistance of Fr Gérard Moussay and Brigitte Appavou. See Huc (1850). The two priests were the only Europeans to travel to Lhasa between Thomas Manning’s visit in 1811 and the British military expedition in 1903-1904. The MEP was able to send missionaries to Kyushu in 1863, the first since the suppression of Christianity in Japan two centuries earlier. They subsequently established contact with the underground Kakure Kirishitan (‘Hidden Christians’). Launay (c.1905) provides the classic history of the mission in the 19th century. His work is carefully sourced but his quotations of missionary correspondence need to be checked against the originals. Deshayes (2008) is an important recent study, including the missions 20th-century history. See Deshayes (2008), pp. 307-317. For a more detailed analysis of these developments, including archival references, see Bray (1997). On these negotiations and the wider politics of the Sino-Tibetan border see Lamb (1989). For a hagiographical account of Tornay, see Marquis-Oggier & Darbellay (1993). In 1992, the Vatican announced his beatification, the first step towards formal recognition of his sainthood. Latin also served as the language of communication between new missionaries and the local catechists who served as their guides. The MEP archives contain an effusive letter in Latin from Telephorus Hiong, the only Tibetan to be ordained to the priesthood during this period, to Bishop Félix Biet in 1896. In addition to the sources cited, this section draws on extensive personal contact with Moravians in India since 1978, as well as archival research in London and Herrnhut. I gratefully acknowledge the assistance of Lorraine Parsons in London and Rüdiger Kröger in Herrnhut. On Jäschke’s approach to Bible translation see in particular Francke (1899). For the wider history of the Tibetan Bible, see Bray (1991). See Walravens (2010) for a facsimile edition of the newspaper. The English translation is from a typescript by Walter Asboe in Moravian Church House, London. For an interesting contemporary analysis of the relationships between the various ethnic groups see Ekvall (1939). For the C&MA’s history (including a run of periodicals covering the missions fields in the early 20th century) see the C&MA website: www.cmalliance.org. For the early history of the Kansu and Tibetan border mission see Ekvall (1938). These paragraphs draw on Victor Plymire’s papers in the Billy Graham Center, Wheaton, Illinois. I am grateful to the staff of the Center for their kind assistance. Jackson (2004) offers a valuable biographical study of Ekvall, but this focuses more on his academic contributions than his missionary work. Ekvall (1981: xii). See also Ekvall (1964: 98-114). The same point arguably applied in village society as well as at the national political level. I hope to elaborate on this elsewhere. For a striking set of photographs of the churches and their congregations taken in the early 2000s, see the website of the French photographer Jean-Louis Moreau: www.jl-moreau.com. Accessed on 29 May 2011. See www.gsungrab.org. Accessed on 28 May 2011. JOHN BRAY: After graduating from Cambridge University in 1978, Mr. Bray spent two years teaching in India, first at a school for Tibetan refugees near Dehra Dun and then in Ladakh. On his return to the UK he embarked on a career as an international political risk consultant. At the same time, he has maintained a parallel existence as an independent scholar working on the history of Ladakh, Tibet and the Himalayan border regions. His recent publications include articles in The Tibet Journal, Zentralasiatische Studien and the Journal of the Royal Asiatic Society, as well as an edited collection of papers on Ladakh for Rivista degli Studi Orientali. “Ladakhi Histories: Local and Regional Perspectives”. Edited by John Bray. Brill’s Tibetan Studies Library. Vol. 9. Leiden: Brill Academic Publishers, 2005. 402 pp. “A Bibliography of Ladakh”. With Nawang Tsering Shakspo. Warminster: Aris & Phillips, 1988. Header image: Illustrations left and right from Tibetan Catechism by Edward Amundsen, Christian Tract and Book Society, Calcutta 1906. Bray, John. (1994) “Christian Missions and the Politics of Tibet”. In Kolonien und Missionen. pp.180-195. Ed. Wilfried Wagner. Münster/Hamburg. Reprinted in: McKay, Alex (Ed.). 2003. The History of Tibet, Vol. 3, pp. 488-500. London. ____ (1997) "French Catholic Missions and the Politics of China and Tibet 1846- 1865." Tibetan Studies 7 vol. 1, Wien pp. 83-95. ____ (2005) “Early Protestant Engagement with the Himalayas and Tibet.” In Ladakhi Histories., pp. 249-270. Ed. J. Bray. Leiden. ____ (2001) “Nineteenth- and Early Twentieth-Century Missionary Images of Tibet”. In: Dodin & Räther, eds., Imagining Tibet (Boston). 21-45. ____ (1992) “Christian Missionaries on the Tibetan Border: The Moravian Church in Poo (Kinnaur), 1865-1924”. Tibetan Studies 5 Narita 369-375. The Ladakhi enclave was called Minsar (Men ser), and continued to pay taxes first to Ladakh and then to Kashmir until the mid-20th century. The Bhutanese enclaves were near Mount Kailash. Slightly updated reprint of 1997 article.